An Arctic air mass blamed for the deaths of more than 20 people in the US began moving out to sea Friday, easing its grip on about a dozen states that have endured days of record-breaking cold now known as 2019 Polar Vortex. 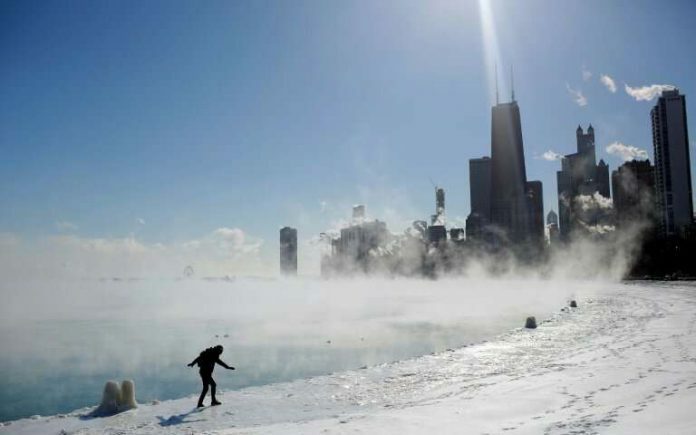 The death toll rose from a previous 12 after at least nine more people in Chicago were reported to have died from cold-related injuries from 2019 polar vertex, according to Dr Stathis Poulakidas at the city’s John H Stroger Jr Hospital. “Temperatures will slowly begin to moderate as the air mass slowly warms,” the National Weather Service said. “They are life-threatening temperatures, and they should be treated accordingly,” Chicago Mayor Rahm Emanuel cautioned residents Wednesday evening. Hundreds of warming centres were opened for vulnerable residents such as seniors, and shelter capacities increased for the homeless. Among the reported dead this week was an 18-year-old University of Iowa student. In Wisconsin, a 38-year-old woman was found frozen Wednesday night in an unheated home, and a man froze to death in his back yard Thursday afternoon, the Milwaukee Journal Sentinel reported. A 69-year-old FedEx worker was found dead outside of an Illinois delivery hub, according to TV station WQAD.